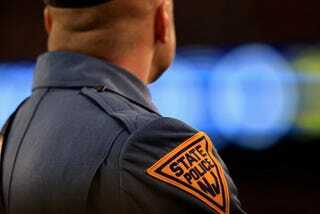 For the second time in six months, a New Jersey state trooper has been suspended and criminally charged after being accused of pulling over women to ask them out. According to NJ.com, Trooper Eric Richardson, 31, was charged Wednesday with records tampering after an internal investigation found that he repeatedly pulled over two women to pressure them into dating him and then lied on paperwork in order to cover it up. “We’re policing our own personnel,” state police spokesperson Capt. Brian Polite told the news site. According to a statement from the state Division of Criminal Justice, Richardson stopped the women on state roads and “harassed” them about “initiating a personal relationship” between August 2016 and January of this year. He allegedly tried to “ingratiate” himself with the woman by not impounding their unregistered vehicles. At one point, Richardson pulled over a woman and, upon discovering that she had an active warrant, threatened to arrest her unless she gave him her phone number. He also allegedly communicated with that same woman via social media and text message. An investigation by the state police’s internal-affairs office later found out that Richardson falsely reported to dispatchers that he had pulled over a man on Dec. 23, when he had actually pulled over one of the women he was preying on, authorities say. Richardson is accused of deactivating his dashboard camera on his troop car during some of the stops. Richardson faces charges for his alleged coverup, including third-degree tampering with public records or information and fourth-degree falsifying or tampering with records. If convicted, according to NJ.com, he faces up to five years in state prison.